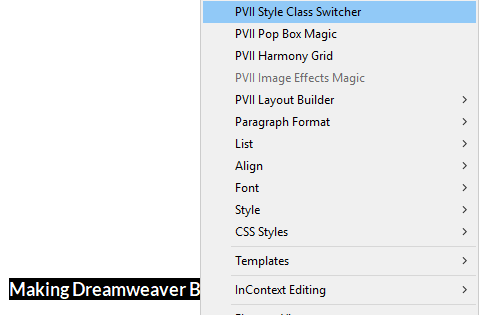 PVII CSS Class Switcher (SCS) is a free extension designed to help Dreamweaver users leverage the power of CSS to produce engaging behaviors that work in all devices. So, read on and learn how SCS works. You'll be glad you did. If you might think that CSS alone is all you need, you would be wrong. CSS animations, using the :hover pseudo element, work fine on traditional computers that use a mouse. Hover over the element and the animation fires. Move your mouse away and the animation reverses itself, returning your element to its default state. But what about touch devices? Well, that's a big problem, because phones, tablets, and other touch devices do not natively process mouse over and mouse out events. Once you tap your element, it is forever frozen in the :hover state. The CSS Class Switcher handles this seamlessly. Tap once on a phone or tablet and the animation fires. Tap again and the effect reverses. It's kinda like magic. b) Allows you to write rules that permit all of your content to be easily editable in Dreamweaver Design View. Obviously, you'll learn how to use PVII CSS Class Switcher. But there is a related matter—a very important matter—of collateral CSS knowledge! Study the CSS in the lessons and you'll learn about positioning, transitions, transformations, and lots of other things. Read between the lines and you'll witness the power of PVII Harmony: a page layout tool that goes far beyond what can be done with Dreamweaver's built-in layout tools. So, read on...and learn! CSS Class Switcher is a powerful tool. The effects you can create and orchestrate are limited only by your imagination. And...in case you were wondering—yes, we will be showing you how we made this little animated effect. So, read on! Unzip it to a safe location anywhere on your hard drive. Extension installer files come in 2 formats: MXP and ZXP. MXPs are supported by Extension Manager versions MX, MX2004, 8, CS3, CS4, CS5, CS5.5 and CS6. ZXP is supported by versions CS5.5 and higher. To install SCS, open your Adobe Extension Manager, click the Install icon or link, and then browse to where you unzipped the installer files. There are 4 ways to access SCS Choose the one most suitable to your workflow. When you open the interface, the system will detect the appropriate mode (Insert or Modify) based on where your cursor is. When you are Creating a new SCS instance, place your cursor inside the element you wish to trigger the SCS effect. If Modifying an existing instance, place your cursor anywhere inside the triggering element and use one of the 4 methods below to open the UI. The system will always open in the correct mode. If your cursor is not inside another SCS instance, the main UI will open in Create Mode. Note: Nesting is discussed below in its own topic. Place your cursor inside your desired trigger and right-click. 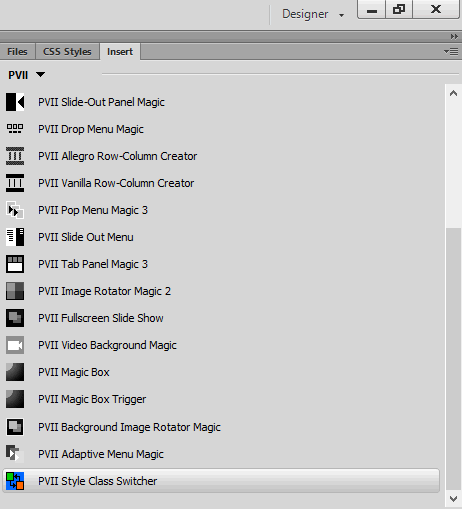 Choose PVII Style Class Switcher. The SCS interface makes adding effects to your page easy! The UI allows you to easily define and configure an effect. Once configured, the UI can be used to modify (edit) your effect as often as you like. Follow the steps below to create a new effect. a. Create a custom CSS class. Tip: The CSS rules you create can go inside an existing style sheet linked to your page or inside a pair of style tags in the head of your page code. Simply copy the 2 rules above and paste them into your style sheet. Enter the custom class name, emphatic, in the Class Name to Assign box. In the Action section, check the Enable Mouse Action option. This is the result. When hovered over, or tapped, this paragraph will turn red. The simple effect above is quick and easy to set up. But let's say you wanted the effect to be animated...for the background color to fade in and then out. How would you do that? Well, it's all about CSS. While advanced CSS coders will know exactly how to use CSS Class Switcher, a non-coding designer might need a little help to get pointed in the right direction. Are you ready to learn? Of course you are. The second class [.emphatic-animated.triggered] is actually a combined selector, which is one of the more powerful CSS techniques you can clip to your CSS tool belt. Combined class selectors string together two (or more) class names with no spaces between them. In plain English, our combined selector directs the browser to look for elements which have 2 classes assigned: emphatic-animated and triggered. This paragraph contains an effect that changes background color, foreground color, and border attributes. Mouse over (or tap) to see how it works. When you mouse out (or tap again) the effect will be reversed as the SCS-assigned class is removed and the paragraph reverts to its default styling. You have a considerable amount of additional information relevant to a particular topic on your page. The information is such that only some visitors will want to see that information. Using CSS Class Switcher you can easily keep that information hidden until an interested party click (or taps) a link to access it. We also want to dress up the trigger link in some fancy duds. Let's start there. Create the CSS rules for the trigger. For this exercise, we will leverage the power of the Mark Active State option in the SCS UI. When this option is turned on, the triggering element is assigned a special class when the effect is running: scs-active. The triggered class is the class assigned to the paragraph by SCS, when the Additional Info... link is clicked or tapped. We set up the effect by creating the trigger link, which we do by typing the words: Additional Info... selecting them, and making them a null link (#). Set your options exactly as they appear in the above screen capture. Click the Additional Info link below to see the effect. And this is more information, which was triggered by a CSS Class Switcher effect! In this case, the effect is disjointed, meaning that it is assigned to a link that when clicked will assign a class to another element on the page. When you clicked or tapped the Additional Info... link, this paragraph is assigned the triggered class, which makes it appear! While we chose to hide and show a paragraph, you can just as easily use a DIV, in which case, your additional info can contain mixed content, such as images, lists, and even forms! There may be times when you want to trigger a series of disjointed effects. Consider a two-column structure with a series of links in the left column that control the color scheme of the right column. These styles define the look and behavior of the links in the left column. Copy them to your style sheet. /* Set up an animation effect for the links. Tip: You can create easy, responsive multi-column layouts using PVII Harmony Page Layout Builder. That's what we used! We're going to assign an SCS effect to each of the links in the left column. Place your cursor inside the first link Cornflower Blue. 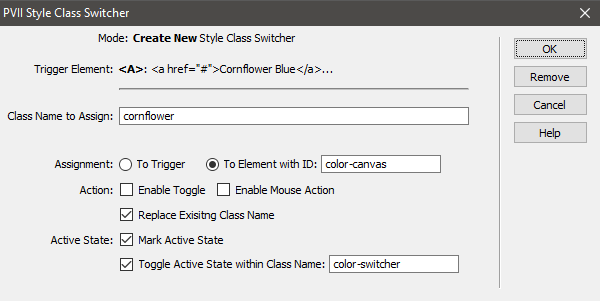 The class name cornflower will be assigned to Element with ID: color-canvas. Enable Toggle and Enable Mouse Action are both turned off (unchecked). Disabling the toggle simply ensures that clicking or tapping a link a second time will not fire an SCS effect. Replace Existing Class Name ensures that when a link is clicked (or tapped) all classes, including those previously assigned by SCS, are removed from the target element (color-canvas), and a new class assignment is set based on the SCS effect for the trigger being used. Mark Active State, tells SCS to assign the scs-active class to the trigger you have clicked or tapped. Toggle Active State within Class Name: color-switcher tells the browser to look at all elements inside the color-switcher element (which is your list of links) and remove the scs-active class on each element—except the one that was just clicked or tapped. Check out the demo below. If you've followed all the steps, your color switcher should work just like ours. Click or tap the Pick a Color Theme links to see the effect. Would you like to learn how to orchestrate an ultra-cool animation effect? As you surely noticed, there is a really neat animation effect on the CSS Class Switcher home page. Let's see how it was done. 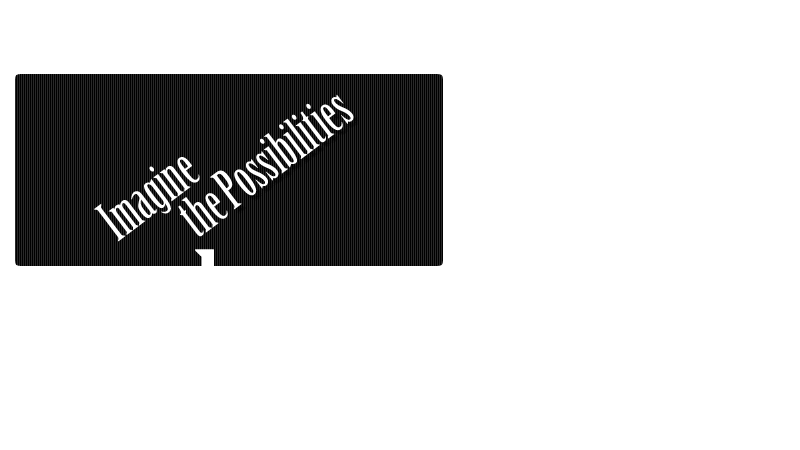 Note: If you'd like to use our image, right click this link and save the image to a folder inside your local Dreamweaver site. You can, however, use any image you like. Note also, that because this page was made using PVII Harmony, all images are automatically responsive. Yours might not be if your page was laid out using Dreamweaver's page building tools, so do be mindful of your image's size. The code for this effect is extremely simple. Adjust the image name and path if needed. Assign your SCS options exactly as they appear in the above screen capture. Mouse over or tap the image below to see the effect. 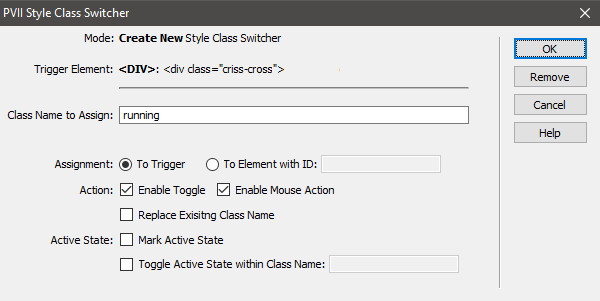 CSS Class Switcher is a powerful tool. The effects you can create and orchestrate are limited only by your imagination! The Modify UI adds on additional button: Remove. Click this button to remove the selected SCS instance. If this is the only instance on your page, the link to the SCS script file will also be removed. Before making a support inquiry, please be certain to have read the documentation that came with your product. Please include Dreamweaver version, as well as your computer operating system type in all support correspondence.